The Translation judges for the National Book Awards--Richard Miller, Alastair Reid, Eliot Weinberger--cited Clayton Eshleman and Jose Rubia Barcia's translation of Cesar Vallejo's The Complete Posthumous Poetry as follows: "This, the first National Book Award to be given to a translation of modern poetry, is a recognition of Clayton Eshleman's seventeen-year apprenticeship to perhaps the most difficult poetry in the Spanish language. Eshleman and his present collaborator, Jose Rubia Barcia, have not only rendered these complex poems into brilliant and living English, but have also established a definitive Spanish test based on Vallejo's densely rewritten manuscripts. In recreating this modern master in English, they have also made a considerable addition to poetry in our language." 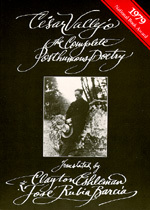 Clayton Eshleman, a well-known poet and translator, has produced forty volumes of poetry. Jose Rubia Barcia was Professor Emeritus of Spanish and Portuguese, University of California Los Angeles at his death in 1997.